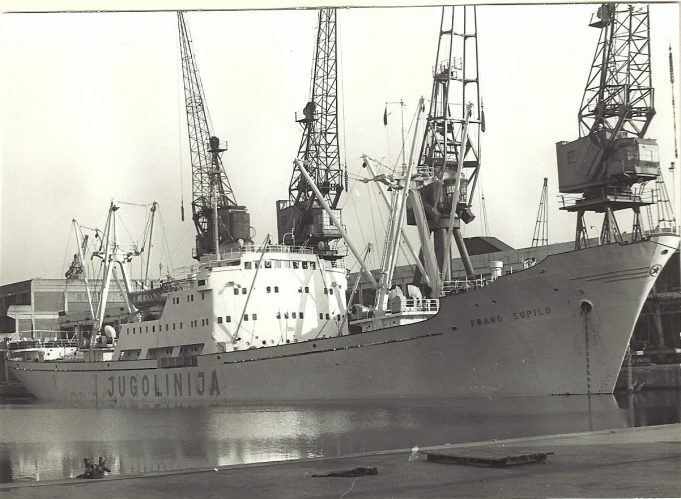 The Yugoslav Line vessel FRANCO SUPILO. She was built in 1961 @ 2,284 grt. Who was Franco Supilo and what was her fate ? I took this photograph in 1971 ? Jugolinija (Jugoslavenska Linijska Plovidba) of Rijeka, Yugoslavia, had been operating since the early postwar years and its ships called at various docks in the port of London, including Tilbury. It maintained a modern fleet and an addition in 1961 was the smart FRANO SUPILO (note FRANO), which was of 2284 tons gross, 2954 deadweight. The vessel was sold out of the fleet in 1981 but its later career was short-lived. In August 1982 it suffered extensive fire damage which was not repaired and it was broken up at Brownsville, Texas, during 1985-86. As for the individual after whom the vessel was named, Frano Supilo was a prominent Croatian politician (born 1871, died in London 1917) who was very much against the Austria-Hungary empire, which supported Germany during the First World War. While living in London, he was involved in meetings that helped in the movement to form the federation of states that became Yugoslavia. He is regarded as a “national hero” in the modern Croatia.